I’m not going to lie to you – learning to read standard notation on the guitar is a lot of work. It also takes tons of practicing. In these lessons I’m going to give you the basics, along with one exercise for each new concept. It’ll be up to you to find other things to practice with. If you work with it, though, it’ll be well worth the effort – there won’t be any music you can’t understand or adapt to the guitar, even if you’ve never heard it before. Oh yeah – the illustrations are copyright 2002 by NoteBoat Inc. (my publishing company) because I’m basically just cropping artwork that appeared in my theory book… the ones labeled “Exercise #…” are created for this article, and are copyright Tom Serb 2005. Standard notation is very visual: the higher a note is on the staff, the higher it will sound. Notes are symbols that indicate how long a sound lasts. Notes are made up of one or more of three basic parts: a head, a stem, and flags or beams. If a note has ONLY a head, the head is always hollow (as shown), and the note is called a whole note. Notes with stems and hollow heads are called half notes; notes with stems and solid heads are called quarter notes. Notes with one flag are called eighth notes. The shapes of notes tell us how long the sounds last. A half note lasts for half the time of a whole note, a quarter note lasts for half the time of a half note, and so on. Music isn’t just made up of sounds, though – it’s also made up of the silences between sounds. We need rhythmic symbols to indicate how long to NOT play, and we call these symbols rests. But that only gives us notes from D (below the bottom E line) through G (above the top F line). That’s eleven notes… and we can play a lot more than eleven different notes on the guitar. In each case, the bottom number is 4 – that tells us that a quarter note will get one beat. The top number tells us how many beats will be in each measure. Since the time signature here is 4/4, there are four beats in each measure, and a quarter note represents one beat. There are four sixteenth notes to a quarter note… here the sixteenth note flags are joined together into beams, with each beamed set being one beat. After every fourth set of beamed notes is a vertical bar line, which helps us keep track of the ‘one’ count. One last thing and we’ll start to play… the time signature 4/4 is so common in music that it’s sometimes indicated by the letter C. Musicians refer to this as ‘common time’… it’s not really a letter C, but that’s a music history lesson for another article. If you see C instead of a time signature, count it as 4/4. Ok, so we’re done with the basic tools – you know the note shapes, the letter names of staff positions, what note gets one beat, and how many beats are in a measure. Time to pick up your guitar! Make sure you’re getting the count right – the first note takes four beats, the next two notes two beats each, etc. Go slow – this takes time to read ‘at sight’. Ready to read? Let’s go! Dots after notes mean the original note value is extended by one half – a dotted half note is a half note (two beats in 3/4) plus half the value of the original note (one more beat in 3/4) for a total of three beats. Ready for a stab at waltz time? If we’d used a whole note to represent this sound – a whole note is also four beats – the third measure would have ended up with six beats… two too many. The solution is to split the note into two parts and connect them with a tie. And let’s introduce another concept, partial measures… sometimes you’ll see a piece of music that doesn’t start on the ‘one’ count. To save space, publishers will often have an incomplete measure (less than the required number of beats) at the start of a piece or section. It used to be convention that the last measure of a piece like that would also be a partial measure – the first and last measures would add up to one full measure – but lately I’ve been seeing pieces that don’t end in a partial measure, so some publishers are discarding that convention. When you see a partial measure, start from the appropriate count; the next example will start on beat ‘three’. At any rate, we’ve now got a full octave to play with, so let’s play! Now we’ve reached the note below the staff… to go any lower we need to start using ledger lines. All the open position notes on the fifth and sixth strings will need these temporary extensions to the staff. Well, that completes the strings in first position. There’s still a lot more to discover about standard notation, though… find some music, practice in this position, and in the next article I’ll explore accidentals, double stops, chords, and key signatures; after that, we’ll start moving up the neck to other positions. Thanks for writing and thank you as well for your kind words. 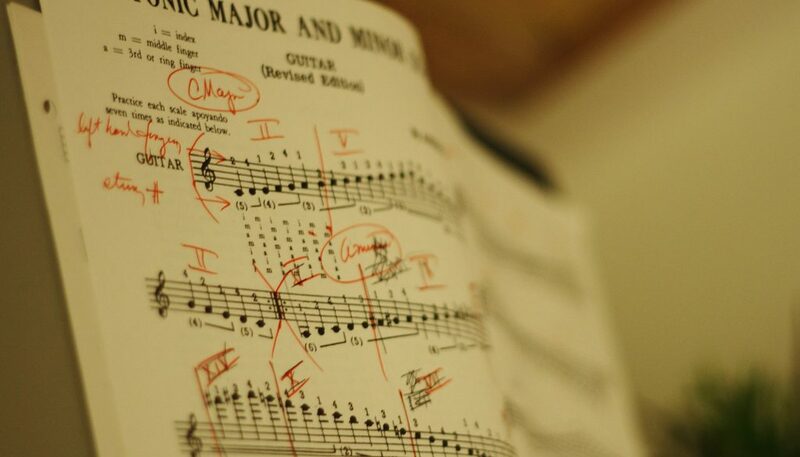 Being able to play while reading notes takes time and practice so don’t get too hard on yourself. The fact is that you’re working at it and that alone will get you making progress. Trouble with progress is that it’s never as fast as we’d like it to be! And that goes pretty much for all of us! Looking forward to hearing how you’re moving forward with your playing. this is indeed a very nice lesson for someone who really wants to learn reading sheet music but had no clue how it works. It really cracked the code of may concepts I was dwindling with. how do we know by looking at the Staff notation, tones to be played on Which String. As the notes, A through G are present on each and every string. If you could reply me, would greatly relieve me as I have been struggling to find the answer since long. 1. By position – if the score says “cV” and the note is G, you’d play it at the 5th fret of the 4th string. The “C” is short for “capotasto” (Italian for ‘fret’) and since the other G notes with the same pitch can’t be reached form that position, what’s left is what you do. The English equivalent would be “5th pos.”, but the Italian is more common. 2. By string designation. A number inside a circle is a string number in standard notation; if the G note has “4” in a circle above or below it, that note is to be played on the 4th string. If the music doesn’t have either notation, it’s up to you. Anywhere you play it, it will still be the same pitch, so it will be correct to the notation. It was indeed a very clear explanation. Appreciate your efforts into this. I dint understand dis line. Pl explain.